The BlackSocks Sock Subscription makes it easy to receive the same high quality black socks each month. If you don’t like buying socks, but you constantly need socks, then look no farther than the BlackSocks.com Sock Subscriptions. It’s the same socks every month – so your individual orphan socks can easily be paired up again. How does it work? Choose your design and size and delivery interval, and then watch the magic happen on auto-pilot. BlackSocks.com has been in business for 15 years. 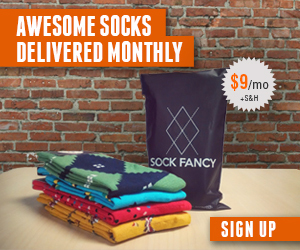 You can sign up for the BlackSocks Sock Subscription here.